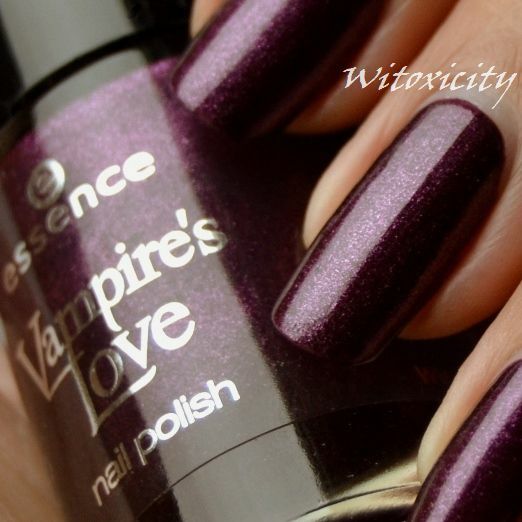 Ah, finally, the last Vampire's Love polish! This is my second favourite one of the lot. In my opinion, Gold Old Buffy wins hands down, but okay, some of you might disagree. Everyone has different tastes. I think this one has the best of both worlds. 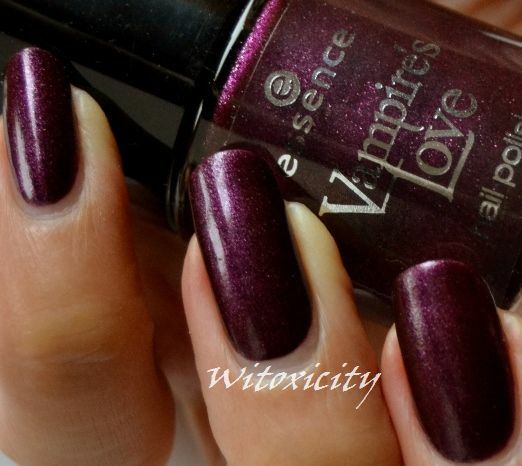 Essence True Love is a plummy purplundy (try saying that multiple times).....a bit more purple than burgundy. These colours are my two favourite nail polish shades. Perfect for the cold, dreary months! With its shimmers/micro glitters, it reminds me a lot of Arcancil Crazy Plum that I showed last year. This one applied better in thick coats (as in, don't drain the brush too much). I have two coats on here. Love. True Love. Vampire's Love. Win this polish in my ongoing giveaway. Just a few more hours to go! What a gorgeous color! And it looks really pretty on you! I love this deep color!